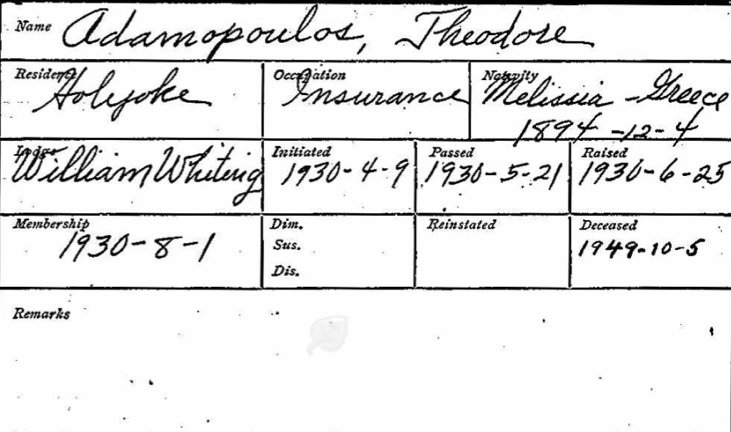 Ancestry.com has a database online that is titled - MASSACHUSETTS, MASON MEMBERSHIP CARDS 1733-1990 which includes 901 people who listed Greece as their place of birth. The Grand Lodge of Ancient Free and Accepted Masons of Massachusetts is the oldest Masonic lodge in the United States, dating back to 1733. This collection contains images of membership cards for men who belonged to that fraternal organization. Grand Lodges grant charters to smaller Masonic lodges, typically centered geographically, although the Massachusetts Grand Lodge at times included lodges in Panama, Chile, the People's Republic of China (meeting in Tokyo, Japan), and Guantanamo Bay Naval Base, Cuba. These cards contain last residence information, birth date and location, death date, the lodge an individual belonged to, date of membership, and occupation. Once you determine a local lodge affiliation, it may also be worthwhile to learn where their records are archived. Clues like dates of residency, birth and death dates, and offices held in the organization may be included in the lodge’s historical records. This collection contains digital images and a digital index from NEHGS. Of the 350,000 images and records in the collection a few items in the index have no corresponding images, and a small number of images are not included in the index.